Andy Reid and the Kansas City Chiefs offense has been keeping me up at night. Every now and then I’ll look at the ADP of their skill position players and notice something feels off, but I haven’t been able to pinpoint who that is or why that might be. So today I wanted to take a deeper dive into the fantasy implications of the offense and walk you through my process in determining how I’ll be ranking these players. 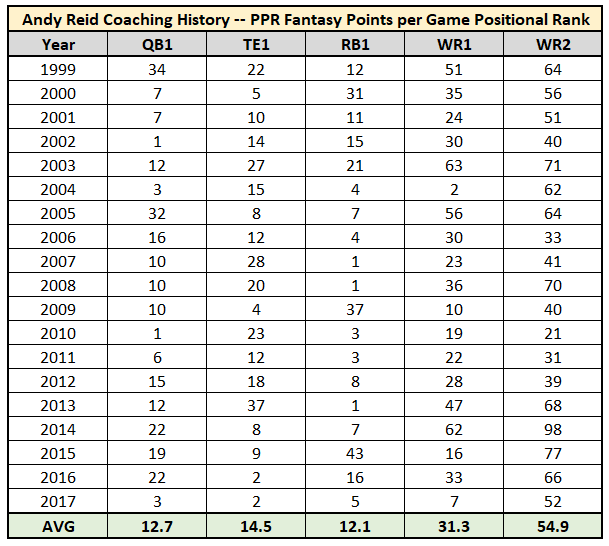 Considering Andy Reid will be calling plays for the Chiefs again this year, as he has throughout the majority of his career, his fantasy track record feels like a place to start. As he was coming out of college, we touted Mahomes as a high-risk/high-reward prospect. Speaking to this, our analysis team wrote in his scouting report last year, “Mahomes is not likely a Day 1 starter in the NFL but is certainly worth a first-round selection as a potential big hit as a franchise quarterback.” Despite considering him to be a little too raw to start right away, Kansas City felt comfortable enough with him starting in year two to trade away Alex Smith following a career year. “Comfortable enough” may also be a slight understatement given how effusive in praise Kansas City brass has been when describing him. Mahomes has little NFL experience, but certainly made the most of his opportunities, ranking as our highest-graded quarterback last preseason and ranking fifth-best as a passer in his lone start in Week 17. Rushing production matters for quarterbacks and, I think, it’s also notable that he totaled more rushing touchdowns than Deshaun Watson over his final two years of college (22 to 21). Reid’s quarterbacks have been ultra-productive throughout his career, but far less so of late – just one top-10 performance over the past six seasons, though it did occur last year. I suspect Mahomes’ ADP of QB17 is fair when contrasting his inexperience with the talent-level of his receivers, though I might prefer the value of some of the quarterbacks being drafted behind him (Marcus Mariota, Jameis Winston, and Dak Prescott). I suspect Mahomes is either appropriately priced and one or more of his receivers are too expensive, or he’s a screaming value and the ADP is correct on his supporting cast. Now, let’s dig deeper into that supporting cast.